Windows users: Save time by skipping the clicking! Ok, I’ll admit it. I’m impatient. Well, at least when it comes to getting things done on my computer. After all, there are only so many hours in the day, right? With that in mind, one of the best tips I’ve learned over the years is that the keyboard is often a lot faster and more efficient than the mouse. I used to get frustrated at having to click through multiple layers of menus, click on the program I want to run and then scroll through a couple hundred filenames until I find the specific file I need to work with. While working in Windows, simply press the Windows+S key combination and then start typing the name of the program you wish to run in the search box. It usually takes just a few keystrokes before the program you want pops up in the list of search results. Click on it and you’re ready to work in no time. Even better, if you know the filename of the specific file you need to work with, simply type it into the search box and click on it as soon as it pops up. The file will automatically open in whatever program Windows recognizes as the default for that file type. I do this a lot when working on my websites. I just do a quick search for the filename of the page in question and click on it when it pops up to have it automatically open in my web editor. This trick also works with system settings. For example, if you want to adjust the speed of your mouse pointer you don’t have to launch the Control Panel and then navigate to that setting with half-a-dozen clicks. Simply press Windows+S and search for the term mouse speed. It’ll pop right up! Want to check to see if any Windows Updates are available? Simply search for the word updates. Fast and easy, right? Bottom line: Using the keyboard to search for the program/app you need is often a lot faster than using your mouse. It can really save you a lot of time, especially if your hands are already on the keyboard! 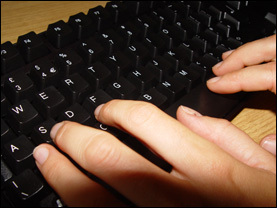 Bonus tip #1: This post explains how to save even more time by using a few awesome keyboard shortcuts.